Posted November 1, 2017 by Studio Assistant & filed under Member Interviews. 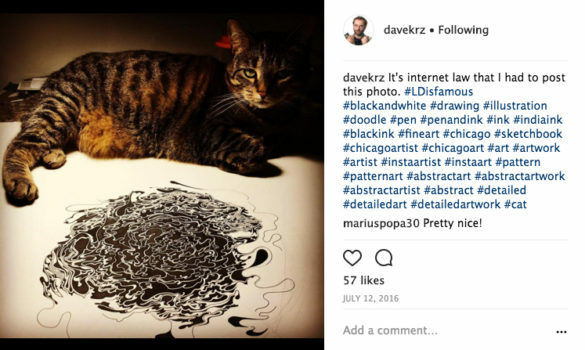 David Krzeminski is an artist and designer that has lived in the Chicago area his entire life. He received his BFA in Visual Communications from Northern Illinois University. 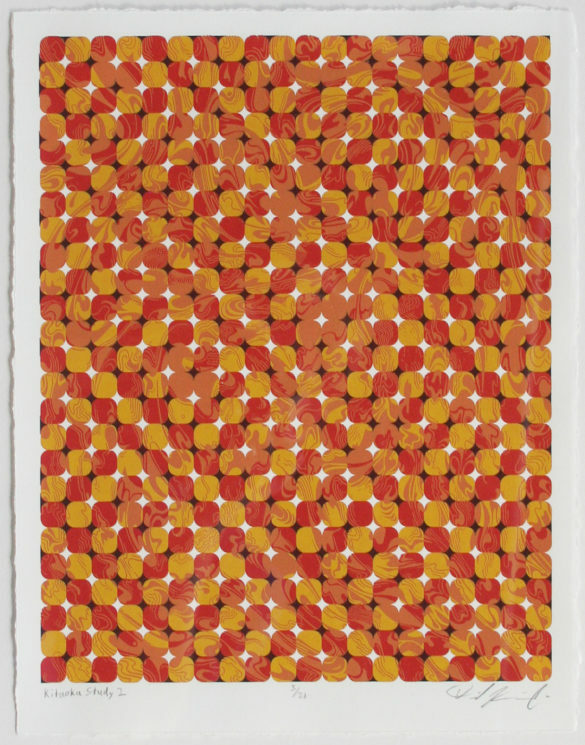 His current body of work consists of black and white abstract drawings, that he then transforms into vibrant, optical illusion screen prints. Tell us a little bit about yourself; what you do and who you are. Well, I’ve been into artwork since I was a kid. I always knew I wanted to do something with it. I always felt like I was going to be drawing, but when it comes to jobs, graphic design has a bit more leeway. I currently work for a trade show company doing graphic layout; displays and graphics for conventions, trade shows, and what have you. That pays the bills and the drawing keeps me sane because offices can get a little… they can wear on you. I need to do something a little funky sometimes to get out of the rut of very monotonous work. Having lived in the Chicago area your whole life—growing up in Palatine and going to NIU in DeKalb—do you feel you’re a part of the greater Chicago artist community, or are you simply an artist living in Chicago? I think as of recently I’m feeling more like I’m part of the art community. Spudnik actually has a big part in that. This is because I’ve been meeting more and more people that also use the space at Spudnik who then introduce me to other kinds of events and art movements. I’ve also been more and more active with my artwork as well. It wasn’t until I was creating more regularly that I felt like I was a part of the community as opposed to just an artist doing my own thing. Now I try to work at least a little bit every day. 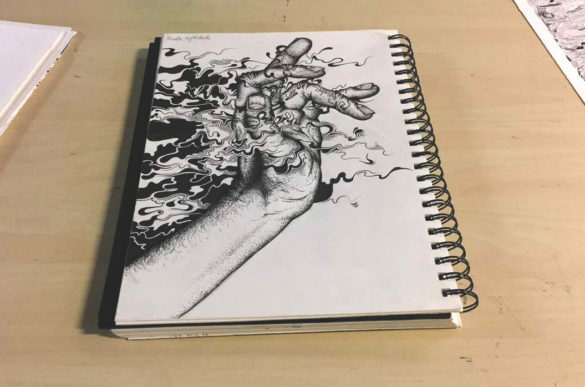 Do you want to talk a little about the work you’ve brought with you; give us a peak inside your sketchbook? Sure. This is actually one of my first prints from when I started printing at Spudnik. It’s one of those impossible triangles with my abstract, squiggle pattern. This was while I was still trying to figure out how to screenprint correctly. I was basically reteaching myself because I hadn’t printed at this point for four years. These are two of my most recent prints. A few of my first prints had a lot of streaks through them or the ink wasn’t quite as opaque as I’d like it to be. It was just a lot of trial and error. I figured out a lot was because of the paper or the squeegee I was using. I was like, “Oh they’re all the same” until one day I realized, “Oh, I’m getting streaks because I picked the same squeegee all the time.” Now I’m figuring out how to print correctly. Kind of a piece within themselves? Unfortunately I don’t really use sketchbooks as often as I’d like to. [flipping through pages] I like this one. The abstract doesn’t really have any dimensions so I’m not really quite sure how it works with the realistic stuff yet, or if I can make it work somehow. This is one where I felt it worked pretty well, though. Here’s an actual concept done in a sketchbook where I was trying out patterns. I did it wrong actually, because the black squares are supposed to be opposite of each other; they’re supposed to go diagonal. But then I realized this plays with your eyes a bit because you want it to follow that pattern where each diagonal one is black, but it isn’t. That made me think I should make it bigger. When you sit at your workspace to create something new, do you have a playlist you like to turn on or anything else to create the right atmosphere for your art making? It depends. Sometimes I’ll put on a TV show or a documentary just as background noise. But, especially when I do my abstract stuff, sometimes I’ll make it a point to not turn anything on, and to just sit and do it by myself in silence. I don’t want to say it’s therapeutic, but the method I use to make the abstract shapes and whatnot is almost equivalent to brainstorming or freeform thinking. I have some set rules and some basic things that I repeat, but other than that, I never really plan the drawing out ahead of time. Sometimes I’ll work in silence to start a drawing, and then once I have a feel for how it’s coming together then I’ll put on some distractions; just kind of go on autopilot with something in the background. Where does the inspiration for your work typically come from, and what kinds of things are influencing your work right now? I’ve been really into optical illusions lately. That’s always been a big influence for sure. One of the big name artists I’ve always liked is M.C. Escher because I feel like he’s the master of illusion. He not only understood the illusion, but had the ability to execute it as well. His work is just super clean, super high contrast, which is huge for illusions. Then, I wouldn’t say I’m going too deep into it, but I’ve been reading some philosophy books. And that’s where I got my idea that if I’m going to be drawing, I need to almost think of it as a meditation. Let my mind go blank. Because I’ve repeated these patterns so much I can let myself do that. I probably wouldn’t have come up with that idea if it weren’t for the book Man and His Symbols by Carl Jung. (Which is a good read. I would definitely recommend it because it’s interesting and not too preachy.) It’s more an overview of a few of Jung’s ideas. There are five different authors and they all touch base on how they think the mind works. 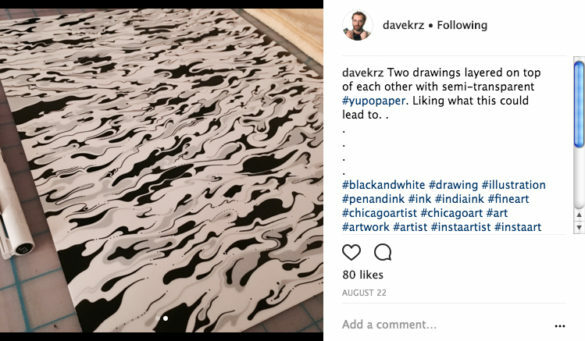 Then there’s one guy in particular from Japan who created the pattern I used for the piece that was in the Spudnik Press benefit show. His name is Akiyoshi Kitaoka. He’s a psychologist that specializes in how vision is interpreted by the brain. He started pumping out this huge series of optical illusions that he created and put them up on his website for people to use. I put his name in the title of my pieces that use his images since it’s his base that makes the illusion work. Then I use my own color scheme and patterns. 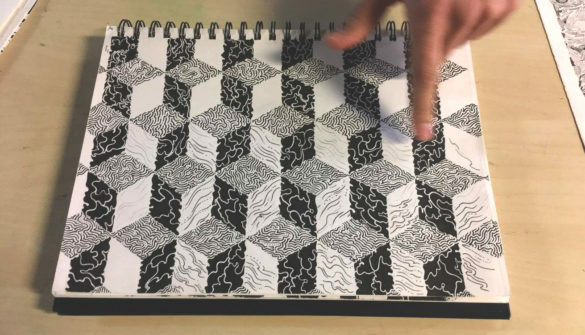 Kitaoka’s thing is based on high-contrast, vibrant colors creating a vibrating illusion that tricks your brain into switching back and forth between what it focuses on. Do you start a drawing intending to make a print of it, or do you just create something first and make that decision later? I think maybe only a couple of times I’ve done something with the intent of printing it as well. 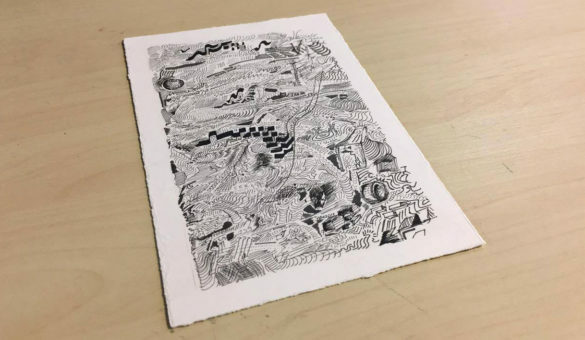 Even the pieces I wanted to print, I was also making as drawings that could stand by themselves. I’ll go through my collection every now and again with a certain pattern in mind, or an idea of a color scheme that I really want to try out. Then I’ll see which of my drawings is going to fit that best. 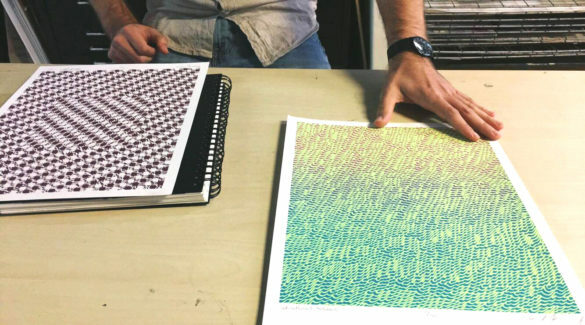 Since you like drawing in black and white, why do you use such radioactive colors in your prints? With my drawings I’ve always been pulled to using black and white. Very rarely do I draw with color, or add paint to a drawing. So when it comes to screen printing, why don’t I just do the complete opposite and go extremely vibrant? Which also goes hand in hand with trying to create illusions. The extremely vibrant, high-contrast colors mess with your eyes the most. That’s why I like using them. I like it when a piece is almost difficult to look at. What do you want people to take away from your work when they see it? I’d like people who see my work to take away that life is messy. Even if you do it the same way every time it’s going to turn out different. Like whenever I do a piece of just the abstract stuff—no pattern, no shapes involved—even if I start drawing the same way it’s a little bit different by the end. Also, I don’t know how easily it comes across, but I’d like to make the world a better place. Not to get too cheesy. [laughs] Basically, you need to keep an open mind that maybe what you’re seeing at first glance isn’t quite what’s there. So many people, especially nowadays, are too quick to think they understand something after just a quick glance. No. Look a little closer. Get your face right up to it and actually look really deep at what you’re seeing because it might evoke something different or spark a thought you’ve never had before. Where if you look from across the room, it’s just a couple black spots on a page. That’s what I want people to take away. Just, think abstractly sometimes. Things aren’t so set in stone. I’m working on a couple of things. Right now I’ve got a three-color print I’m going to do. It’s another pattern by Kitaoka that I’ve done before, but the illusion didn’t really work because the colors weren’t bouncing off each other that well. For drawing, I’m working with layers. I do an abstract base drawing, and then I have an almost translucent Yupo paper that I put on top. Then I’ll draw on top of that to get a two-tone abstract drawing. That’s definitely a new, recent revelation that was actually inspired by screen printing. And where should people go to see your work? I have two pieces in the Spudnik Press member show. Then Hope for the Day, a suicide prevention and awareness organization, is opening a new coffee shop/community center. They’re having a benefit art auction for that on December 2nd at WeWork (20 W. Kinzie St.). I donated a couple of pieces to that. There’s also my website as well as Instagram where I post finished pieces and works in progress regularly. Just to close on a fun note, would you say your cat, LD, is a furrvent (pun intended) supporter of your work? Probably? She usually leaves my drawing table alone—especially when there’s a drawing on it—unless she really wants my attention because something is bugging her. [laughs] She knows she can get a reaction out of me if there’s a drawing on the table and she jumps onto it. So I don’t know if she’s a fan of the art, but she definitely knows it’s important to me. 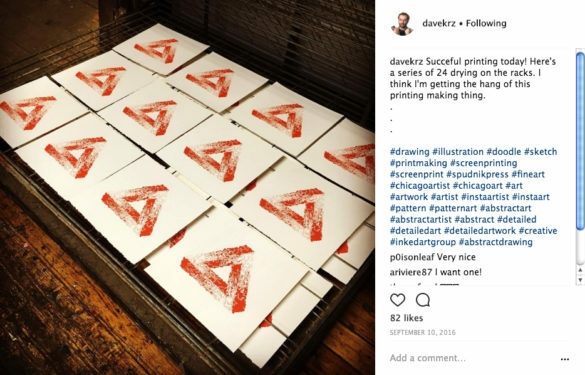 If you want to find out more about David and his work, check out his website or visit @davekrz on Instagram.